Different animals - reptiles, butterflies and insects - from a close-up perspective. Showing details of the animals that often are "hidden" from the human eye, as the "fur" on the body of a butterfly. Chimney Tops Trail, Gatlinburg, Tennessee, United States Length: to 26’’ (66cm), rarely much larger (to 48’’ or 124cm). Scales strongly keeled NON-VENOMOUS This is probably the most frequently encountered snake in the Great Smokies. Eastern Gartersnakes occur in all habitats throughout the park, reaching even the highest elevations. They tolerate human presence and are common around buildings and campgrounds. 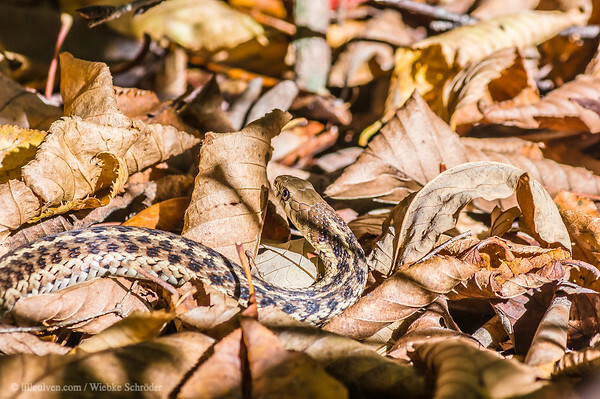 As benefits such a tolerant and successful species, Eastern Gartersnakes feed on a wild variety of prey, including insects, earthworms, slugs, salamanders, frogs and carrion. When disturbed they flatten their heads and bodies, may strike and bite vigorously (but harmlessly), and emit copious strong-smelling secretions from glands at the bases of their tails. • DESCRIPTION–A slender, striped snake with strongly keeled scales. The upper surfaces are normally light brown with a yellow, greenish, or blues stripe down the middle of the back and another down each side. The stripe down the middle of the back may be faint and some specimens lack stripes altogether. There may be a checkered pattern of dark spots between the stripes. The undersurfaces are pale yellow, greenish or bluish, usually with two rows of very small dark spots, partially hidden under the overlapping belly scales. • HABITAT–Abundant throughout the park. [LilleUlven: Great Smoky Mountains National Park] • SIMILAR SPECIES–No other snake species in the park has a light stripe down the middle of the back, but dark or unstriped specimens might be mistaken for Queen Snakes, which have dark longitudinal stripes down their bellies. Source: Reptiles & Amphibians of the Smokies, Steven G. Tilley & James E. Huheey, Great Smoky Mountains Association Gatlinburg, Tennessee 2004 page 74 uuid="EB3580F0-D3D3-4B8E-A544-21044CD74E01" id="United States lilleulven.com _K3_3032.dng Animal Macro Lilleulven.com"